Whatever you choose in your life, it needs to be done with especial accuracy, passion and joy. Otherwise, how would you enjoy your work? If you’ve chosen web development as your profession, I bet you enjoy it, because web development is an incredibly creative process. It’s not just about business online presence, it’s about human psychology, power of colors, intuitive patterns of user experience which are so exciting to investigate. It’s about clean code which creates a slick usage of a website. Here’s a statement: most of the times your website visitor should not remember the website you’ve created. Why? The answer is this: if user interface, design elements, color palettes were chosen correctly, and website functioning didn’t cause him any troubles, he’ll remember the gist of the website, the product or the service offered, but not the design or its functioning. The website design and its functioning should be slick and pleasantly invisible. What are those factors which are noticed by the subconscious of a common user and seen by web professionals? It’s a combination of design and functioning. If you are a developer, you know how to code, but you don’t want to spend your time on designing. Anyway, why would you want to do this if you have another great option? 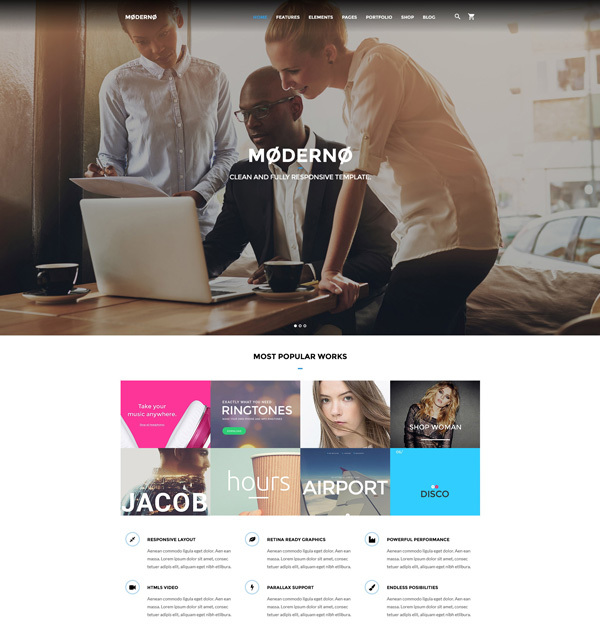 You can simply choose a thrilling design from hundreds of absolutely amazing HTML templates for web designers and web design agencies. There are various designs for different types of projects – for business agencies, online stores, blogs, restaurants, vet clinics portfolios etc. 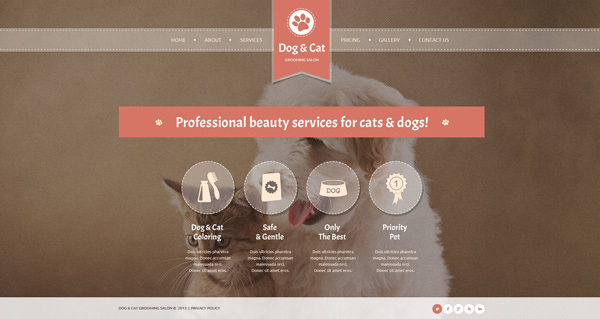 Whichever project you have, you’ll find a brilliant design which may be a perfect match for your website. One of HTML templates compilation is right before your eyes. Just get a cup of coffee, sit back and don’t overlook the HTML template which could possibly become your website. 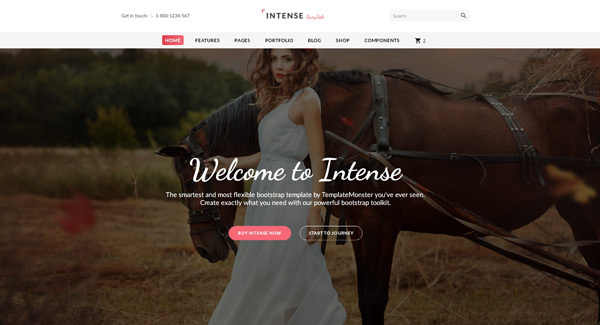 One of the most powerful HTML templates at this moment is Intense. Not only it has a great design and lots of design features, but it also has 10 child templates, which would be especially created for blogs, photographers, gym, child care, restaurant websites and some more (all of them you can see in the live demo). Besides, you may change home skins for your template. In the result, you get just the design of a website which meets your needs. There are 6 home skins which you can use for a home page of your project. Here’s an example of one of them. Regardless of the project that you need, you may choose whichever skin you like. And here’s an example of Intense child template for photographers. All these designs are still in the boundaries of only 1 HTML template “Intense”. Here’s a simple question: what is a prevailing color in all restaurant websites? The answer is red, orange and yellow. For some reason, they rise appetite, and it would be silly not to use them in design of restaurant business. No wonder, this template for a restaurant is created with these colors. Check out the way the images are presented – a grid layout is popular for a reason. Culinary art is half about taste and half about visual. The necessity of using powerful imagery fir this type of business is obvious. When it comes to fashion, design of such websites may vary enormously, just as fashion itself. Full-width image, boxes for blog posts and images which grab a viewer’s attention make a brilliant design. 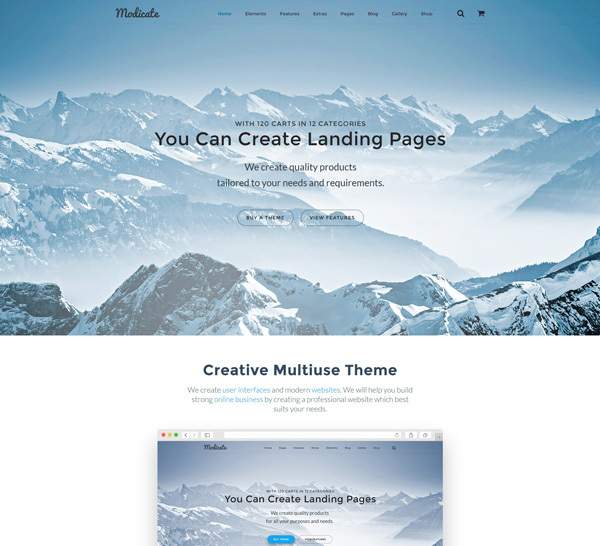 If you need an elegant layout which would channel the view of the visitors to the product, you should consider using this template. Transportation should be safe. If you think of the colors which represent safety, these would probably be blue, green and brown. Take a look at this one, do you feel the trustworthiness which is oozing through this template? Besides, the design is created to direct the visitor to the bottom of the website, thus, to see everything that you need him to see. Speaking of trustworthiness, the potential customers rely on the qualification and they are looking for the proof for it everywhere. 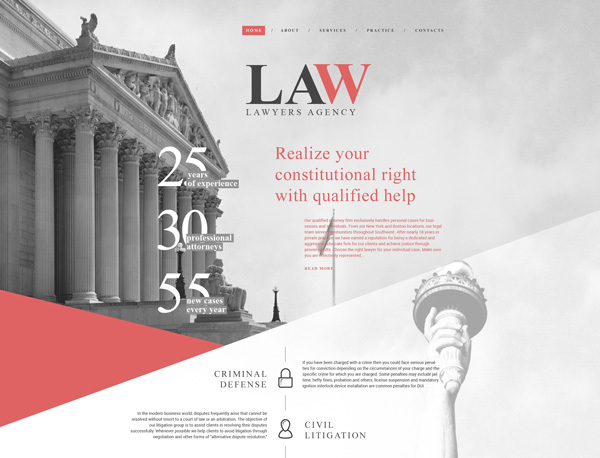 Take this into consideration when making a website for a lawyer. What makes this template for lawyers trustworthy? Grey colors, a small dose of joyful red and an elegant design. Art School Template is a template where a full-width image and a masonry layout make the website imagery as powerful as possible. Dark colors, ghost buttons, social media widgets right on the homepage, all these features make the design pleasant to the eye. At first sight, business web design is initially limited by its purpose. 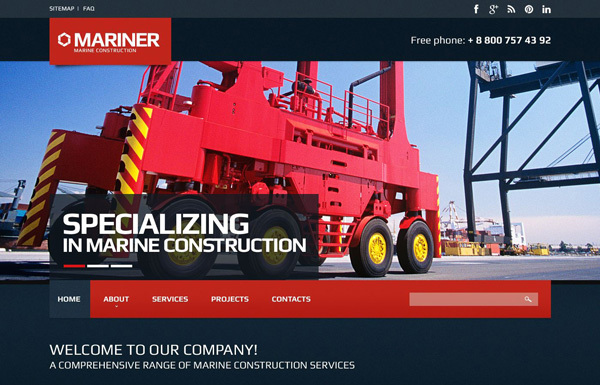 Nevertheless, designers manage to cope with it, using joyful colors, hover effects and a Parallax scrolling effect to make a template “deeper”. This template is a perfect example of that. The word which comes to your mind when you see this template is “cute”. What makes it cute is soft brown colors and lacy widgets. Besides, you won’t help noticing a hover effect which will make experience of the website visitors more exciting. 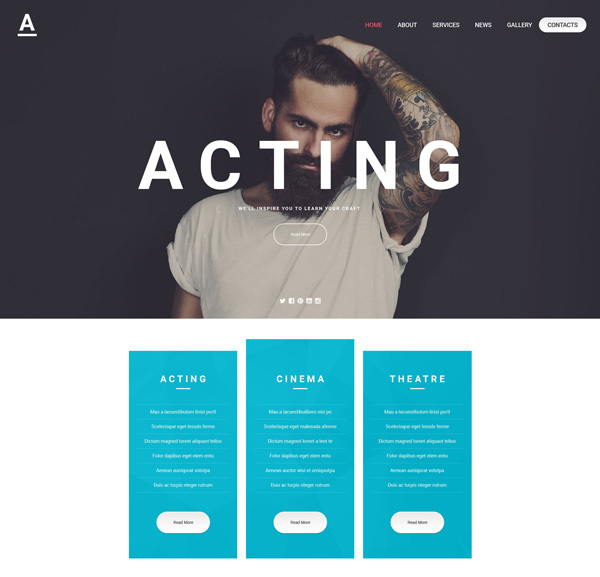 This is a beautiful template where a combination of drop-down menu and neat font makes an incredibly good impression. Apart from that, if you have many numbers which should be visualized and presented in charts, something like this template is very likely to meet your needs. “Communications” would work for many service offering websites. 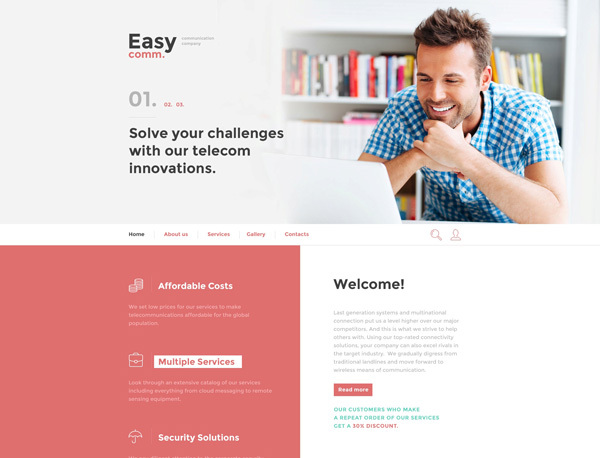 Grid layout alongside with unusually placed menu will make the website stand out of the line of other agency websites, while this template’s colors make bright and cheerful. 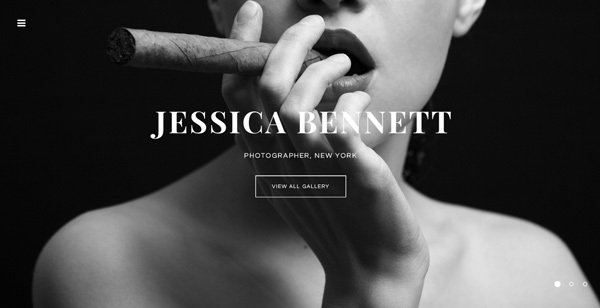 If you’ve noticed, most of portfolio websites now have full-screen images. However, not all of them have their menus on the left. Focus a viewer’s attention on the images. Pay attention to a fine image slider, which looks very natural and resembles of a bird flying. This is an incredinly nature-oriented template indeed. Medical websites are expected to be visited not only by young generations who are used to Web, but by all generations. 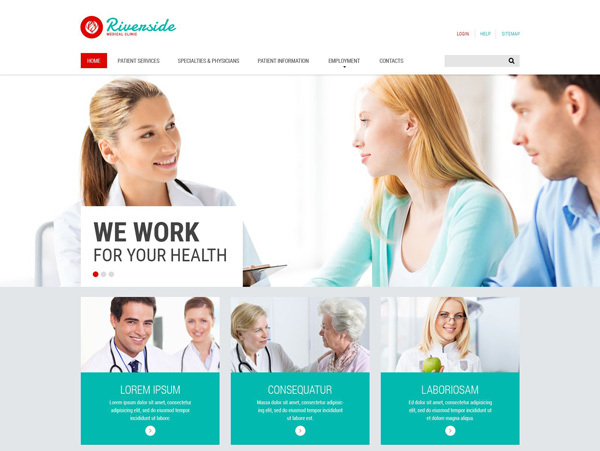 Knowing this peculiarity, web design of medical websites shouldn’t contain any overcomplicated design trends, everything should be as clear and intuitively understandable as possible. 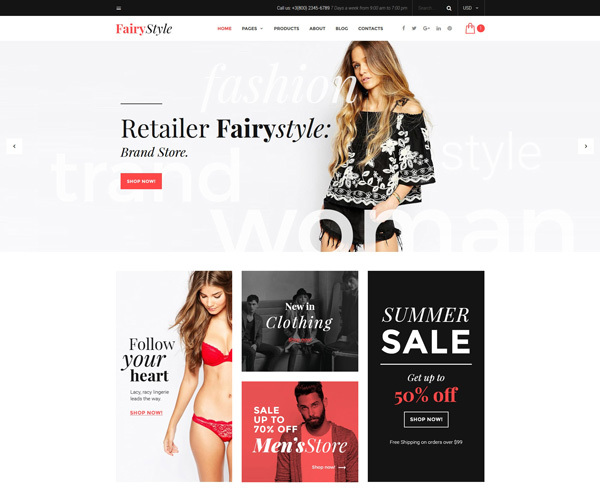 If you are looking for such features as Google map, Google web fonts, clean design and you have primarily female audience, you may like this HTML template. The coziness of its design is incredibly welcoming. 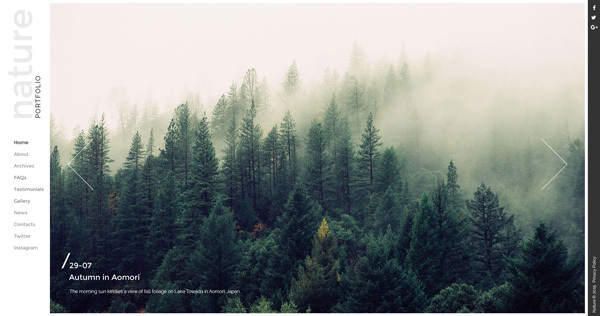 Image sliders don’t tend to be too creative, but this is an incredibly beautiful exception. 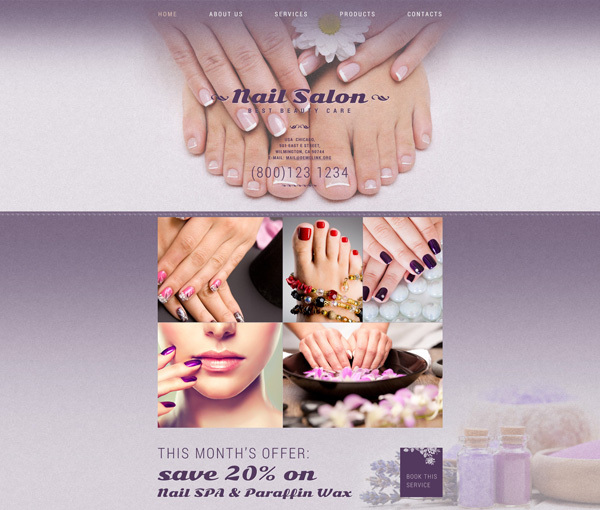 Time on your website will definitely prolong thanks to an usual slider which looks like folded images. You simply can’t help looking through all of them. A joyful romantic blue makes this template outstanding right at the moment when you look at it. The whole design is based on square shape. This is one of the most beautiful ways of combining text and imagery in a template, and we have not mentioned the technical features yet like sliced PSD, back-to-top button, Google map, Google fonts etc. 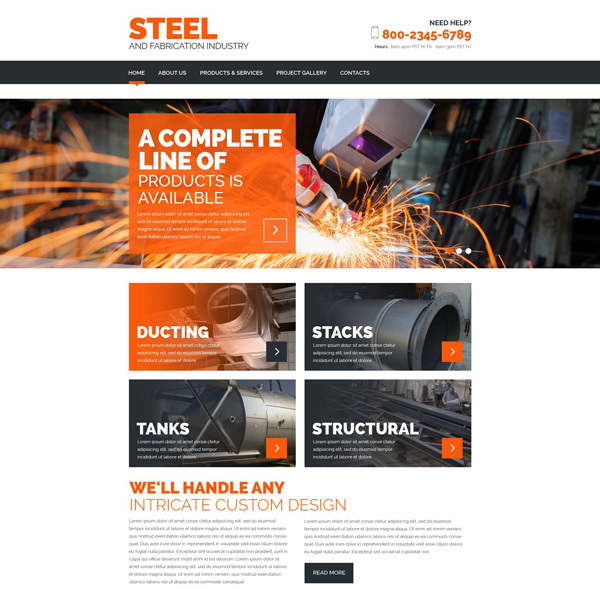 When creating a website for a construction company, the very design of it should make a stout firm impression. This is when a design like this comes into play – a duet of passionate black and a little bit aggressive red makes you think of a truly trustworthy company which is able to create something that would stand firm for ages. 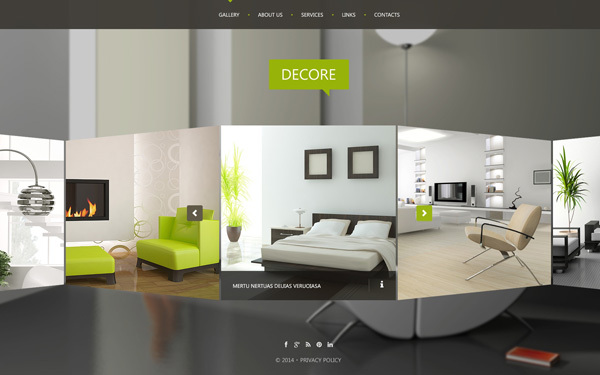 Just as a previous template, this is web design based on a square shape. Bright orange stands for fire, Parallax effect adds depth to the website. A website with a design like this is very likely to convert people. 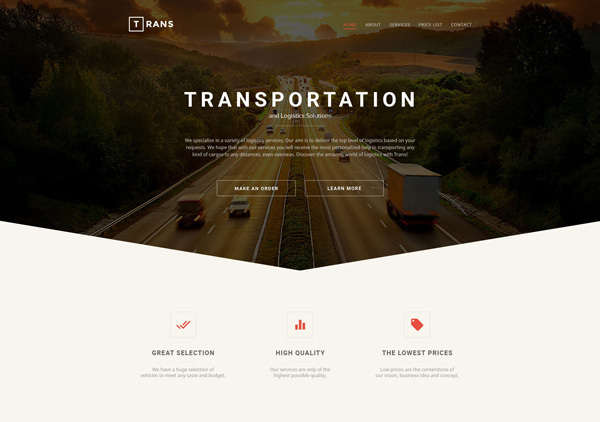 If you like this responsive HTML template, see the live demo. 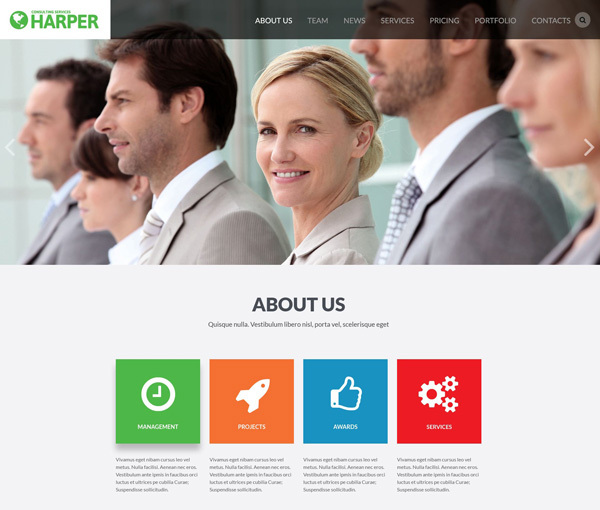 This template has a clean design which makes any agency website look really attractive. 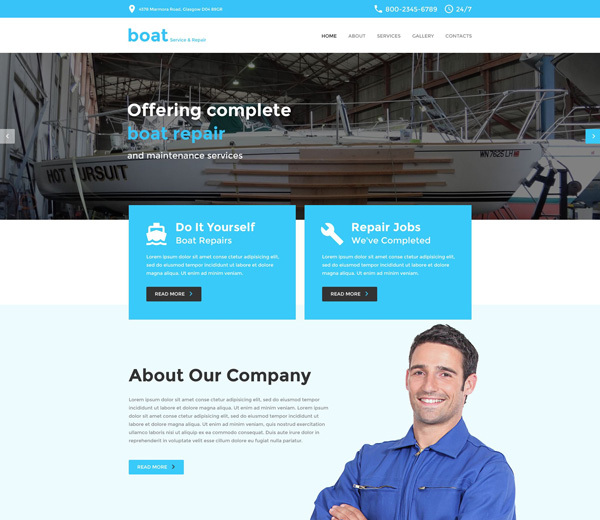 Elegant fonts, grid layout, social media buttons under every member of a team, makes it a decent candidate for any business which needs a beautiful online presence. 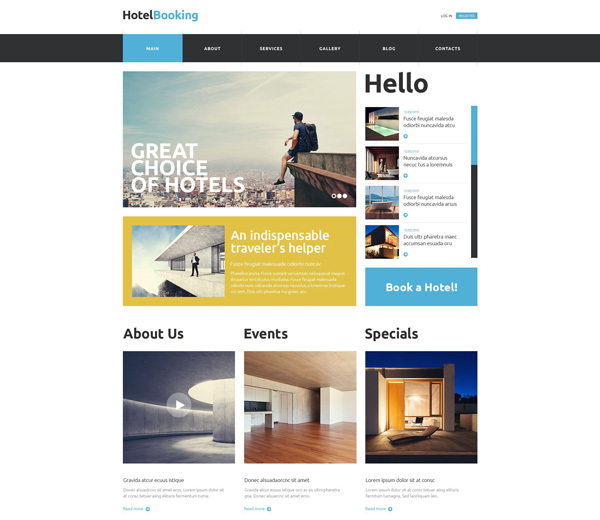 Hotel booking website is meant to be intuitively understandable, so that a person can understand how to choose, book a room and cancel his order if necessary. Yet, it needs to be attractive to showcase the rooms. This template may be a great option for you. 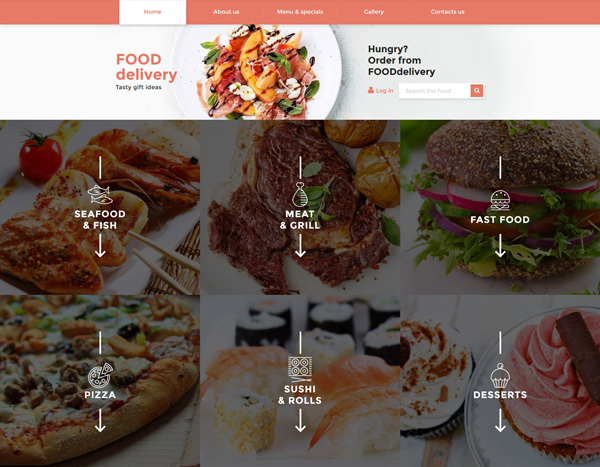 Have you noticed that delivery services have bright colors in their logos? I’m not sure why, but this trick works very well – especially when they use yellow. It’s bright, memorable and incredibly positive. 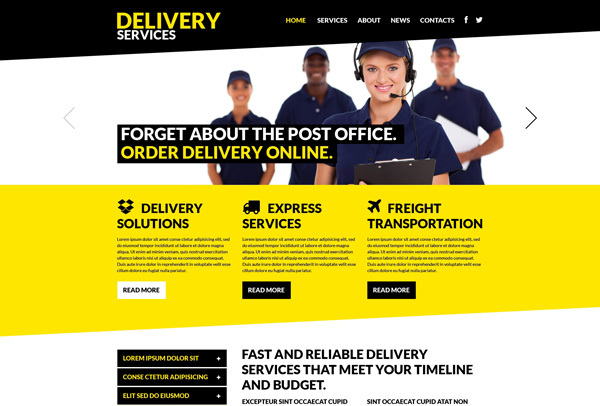 Not surprisingly, an HTML template for delivery service which is based on a combination of black and yellow is a great solution for those who need to create a website like this. Wow, some of these looks amazing. Really like this fancy slider on interior design.